We’d love your help. Let us know what’s wrong with this preview of Love beyond the sparkles by Swapna Marathe. To ask other readers questions about Love beyond the sparkles, please sign up. Thank you for the review copy Swapna Marathe. Swetha is an ambitious engineering student in Jayadevpura who wants to pursue MS in the United States. Their family runs a family business of chains of hotels in the village itself. Having some dispute with their uncle on the grounds of property they feel highly insecure and her family want her to stand on a feet and get a very good job so that she can support the entire family and they don't have to run the family business anymore. Thank you for the review copy Swapna Marathe. Swetha is an ambitious engineering student in Jayadevpura who wants to pursue MS in the United States. Their family runs a family business of chains of hotels in the village itself. Having some dispute with their uncle on the grounds of property they feel highly insecure and her family want her to stand on a feet and get a very good job so that she can support the entire family and they don't have to run the family business anymore. Vikram on the other hand is an adventurous boy with a well of background who wants to extend his father's business into the United States. On a trip to Jaydevpura from Mumbai Vikram meets Shweta and instantly falls for her beauty despite being around beautiful girls in his entire life he felt a strong connection to her which was love beyond the sparkles. On the same trip he discovers that Shweta has a fond of painting and wants to complete her education and get a well of job. on the third of the fourth day of the trip a mishap happens and the entire family of Shweta gets burnt out and it is evident that his uncle had some hand in the mischief. Broken and lost Shweta has no one to fall back upon her family including her father mother and brother are no more there to support her. the accounts of. When she is ready to sacrifice the entire amount of money her parents had saved for their treatment. She even decides to stay back and refrain from completing her studies. It was Vikram who held her throughout, took her to Mumbai, tendered , nurtured and helped her with the procedures along with the support of his family had sorry knew no bounds.slowly and steadily both fall for each other and Vikram cannot go of his love on the other hand sweater has more commitments to complete. She sets her love free while Vikram cannot go of his love for her. The story opens in a coffee shop three years later where Shweta's friend Preeti meets him and takes her to the apartment where he sees numerous paintings of Vikram himself. After 3 years will their love bloom? Will Shweta accept his proposal and live happily ever after? It's for the readers to unfold. "For some people, love is to set it free to get it back. For some, love is breathing and cannot let it go off. When two people with different thoughts about love meet, the sparkles arise. But, how long does this sparkle stay in one’s life? Vikram cannot let go off his love, while Swetha sets it free and leaves the destiny to take over. This book shows how the love sparkled for Vikram and Shwetha even beyond the sparkles and how they travelled through their journey of love." The book has a very nice cover image with a shadow picture of a couple. The title of the book is good and relevant to the plot. The book belongs to the genre of love stories even though not much of a romance is included. Coming to the book, the story is good with a couple of two contrasting characters. One falls in love but had to wait for 3 years to earn his love since career and dreams of parents was more important to the other. The story doesn't include much of a twists barring a couple of them which were very much unsurprising. It's a happy go ending in the climax where everything happened as you wished it would happen. However, the major drawback of the book was the writing style and the editing work of the book. It's a debut novel of the author and it can be evidently seen in the way the story has been told and the way it's been written. There is a lot of scope for improvement in deciding the scenes which could be included and skipped. But the editing of the book has been too bad. The sentence structure formation has been too ordinary and also has a lot of mistakes included. Firstly I would like to thank the author for giving me the opportunity to review this book. My Review:- The book revolves around the protagonist, Vikram who falls in love with a girl while he was in a vacation with his friends. The girl named Shwetha lost her mom, dad and her brother in a fire caught in their house. Shwetha being a brilliant student got a scholarship for her MS in California. Before leaving for California, Shwetha met Vikram's parents. Vikram was continuously waiting for Shwetha Firstly I would like to thank the author for giving me the opportunity to review this book. My Review:- The book revolves around the protagonist, Vikram who falls in love with a girl while he was in a vacation with his friends. The girl named Shwetha lost her mom, dad and her brother in a fire caught in their house. Shwetha being a brilliant student got a scholarship for her MS in California. Before leaving for California, Shwetha met Vikram's parents. Vikram was continuously waiting for Shwetha for 3 years after which he finally get to meet her. Their came a third person between the two. To find out about the third person, pick up the book and read. The book was a simple read. It's very good for the beginners. The story was well set with beautiful background of both Shwetha and Vikram. Different places were beautifully explained. Setting of the story was nice. The boy from rich family and girl from a normal family background was attractive. The story was simple and easy going. There are certain grammatical mistakes and according to me the way of writting should be improved. The dialogues must be kept in mind. The editing must be improved. Rather I can say I'm no one to judge the book, but these must be changed in the next writting. These problems certainly arises with a debut writter. Moreover I would like to say that, the book was good. I liked the story and specially the chief point of the book is that LOVE ALWAYS WAITS also LOVE CAN'T BE ASKED. I recommend this book to every beginner. 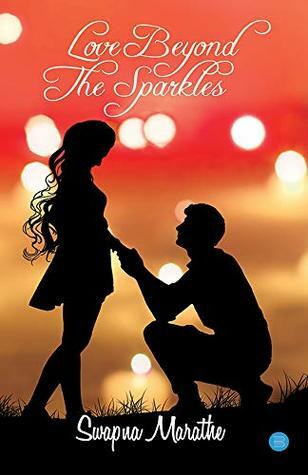 Love beyond the sparkles by Swapna Marathe is a story of Vikram and Shwetha. What happens when opposites meet? Vikram and Shwetha who are completely different from each other falls in love. Will they succeed in their journey of love? The plot of the story is good with twists and turns. I liked the way the author sequenced the events. The narration of the story is simple. The story could have been much better with a crisp narration. It’s a book for the one who wants to read basic stories. The pace Love beyond the sparkles by Swapna Marathe is a story of Vikram and Shwetha. What happens when opposites meet? Vikram and Shwetha who are completely different from each other falls in love. Will they succeed in their journey of love? The plot of the story is good with twists and turns. I liked the way the author sequenced the events. The narration of the story is simple. The story could have been much better with a crisp narration. It’s a book for the one who wants to read basic stories. The pace and flow of the story are slow. The storyline of two contrasting personalities engaged me when I started the book. The story starts in an engaging way but one gets tedious as the story proceeds. The story could have been much better. One can relate to the story though. The language used by the author is simple and easy. The Writing style of the author is easy and basic. The author could have written some dialogues instead of just narrating the story. The story has very few dialogues. Themes like love, drama, relationships are used by the author. One thing that disappointed me was the fonts. They’re too small. It’s a light read but felt like a heavy read because of fonts. Love at the very first sight? Quiet a common thing which people face. This too is a story of the protagonist Vikram who falls in love with Swetha at the first due to her beauty and intelligence. But then, unexpectedly there happens a tragedy which strikes them hard. What happens after that? What happens to Swetha’s ambitions and her parents dreams? How supportive is Vikram in that? Do they both get to be together? Or what does fate has in store for them? The story is all about Vikram and Swetha’s love. Grab your copies to know more. Blurb (3.5/5) – Well penned. Writing Style (3.2/5) – Simple and perceptible. Narration (3.2/5) – Reader friendly. Scenarios are described well. The chapters are well organised and the flow of the story too is good. Readers can easily get in the flow of the story. Every character’s emotions are very well brought out. But I found he starting two chapters to be so abrupt. Equal balance could have been given to the dialogues and the description. Title (3./5) – Apt for the story. Cover (3.5/5) – Neat and presentable. Well suited for the story. Errors (3.2/5)– There were few errors here and there. A feel good love story. Recommended for all. 'Love Beyond The Sparkles' written by Swapna Marathe is a cute Romantic book with intresting characters. The story revolves around Vikram & Shweta who are basically from varied family bcakgrounds but the fate favours them and they meet ! But the journey thereafter has many up's and down's in itself and the author has portrayed the problems faced by the characters. The plot gets interesting when after 3 years Vikram finds Shweta and then how the fate joins them together. WILL SHWETA LOVE HIM BACK? Read the book and find out . The book is recommended for the beginners and the ones who love Romantic books . Shweta is an engineering student of Jayadevpura who wants to complete her MS in USA. And Vikram is an adventurous boy with well background who also wants to go to USA to extend his father's business. On a trip from Mumbai to Jayadevpura, Vikram met Shweta and falls for her. But Shweta being more commited about her life goals, sets her love free. The story revolves around how Shweta come to know about Vikram's love for her, three years later in a coffee shop and falls for him. The narration is a Shweta is an engineering student of Jayadevpura who wants to complete her MS in USA. And Vikram is an adventurous boy with well background who also wants to go to USA to extend his father's business. On a trip from Mumbai to Jayadevpura, Vikram met Shweta and falls for her. But Shweta being more commited about her life goals, sets her love free. The story revolves around how Shweta come to know about Vikram's love for her, three years later in a coffee shop and falls for him. The narration is a bit slow but the language is plain and simple. The author beautifully described all the mentioned cities, be it Jayadevpura, be it Mumbai, be it Texas, be it California. The characters are well developed and I just loved the cover page of this book. For the review copy and the cute bookmark alongwith it. Recommended for all those who love romantic stories. It's a perfect blend of love, courage, committment and sacrifice. Writer has depicted two different vibrant characters with lots of contrasting colours. Where Vikram was sensitive emotional and a little bit egoistic there Shweta was rational practical and enough courageous to accept the harsh truth of reality . Where Vikram was not ready to sacrifice love for anything there Shweta was ready to sacrifice every luxury and happiness for her career. Anger ,courage ,ego , jealousy ,confession every emotions of a sweet love story has been contented in this book. Wr Writer has depicted two different vibrant characters with lots of contrasting colours. Where Vikram was sensitive emotional and a little bit egoistic there Shweta was rational practical and enough courageous to accept the harsh truth of reality . Where Vikram was not ready to sacrifice love for anything there Shweta was ready to sacrifice every luxury and happiness for her career. Anger ,courage ,ego , jealousy ,confession every emotions of a sweet love story has been contented in this book. Writer has made this book heartwarming by a good mixture of sweetness of love and bitterness of sacrifice. So many grammar mistakes, character build is very weak. Title: its new and catchy. Cover: it is attractive and promises to take the reader on a romantic journey. Vikram meets Shwetha on a casual trip to Jayadevapura. Circumstances bring them together. Vikram confesses his love for her before she leaves to California to realise her parents dream. Vikram cannot let go off his love, while Shwetha sets it free and leaves the destiny to take over. After 3 years they meet. Will shwetha love him back? Will she accept his proposal? Will they live happily? Is what the book is all about. The detailed description of places be it jayadevapura, California, Mumbai, texas, or Austin is very well described by the author. The font of the book could have been a little bigger so as to not strain the reader. The vocabulary and grammar definitely needs a lot of editing. It spoils the interest of the reader. I would suggest the book goes for a re-editing. A nice romantic one time read .